I know in previous reviews I have expressed my family's love of peanut butter, so needless to say I was super excited to work with Peanut Butter & Co. again! All of Peanut Butter & Co.'s peanut butter is all natural, Kosher, gluten-free. All of their flavors except The Bee's Knees is vegan, The Bee's Knees is vegetarian. Their peanut butters also contain no cholesterol, no trans fat, no hydrogenated oils, and no high fructose corn syrup. They sell ten different flavors of peanut butter as well as jellys, jams, nuts, snacks, baking mixes, and more! Their peanut butter is found in supermarkets, specialty stores, and natural food stores all over the country and they even have a sandwich shop in NYC! Peanut butter from Peanut Butter & Co is by far my family's favorite brand of peanut butter and I think that it will become a go-to staple in your home too once you try it! 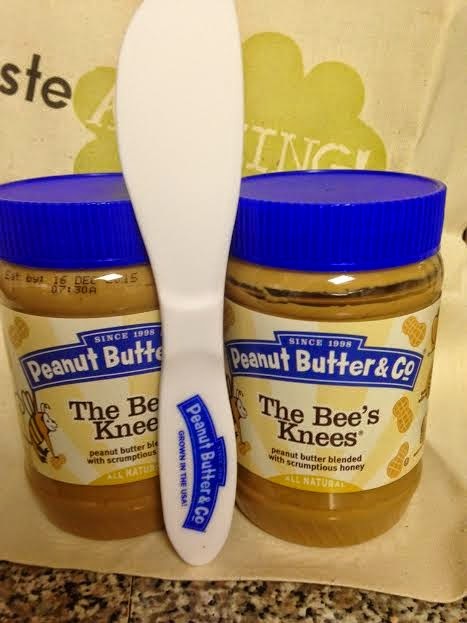 Enter below to win two jars of The Bee's Knees peanut butter! 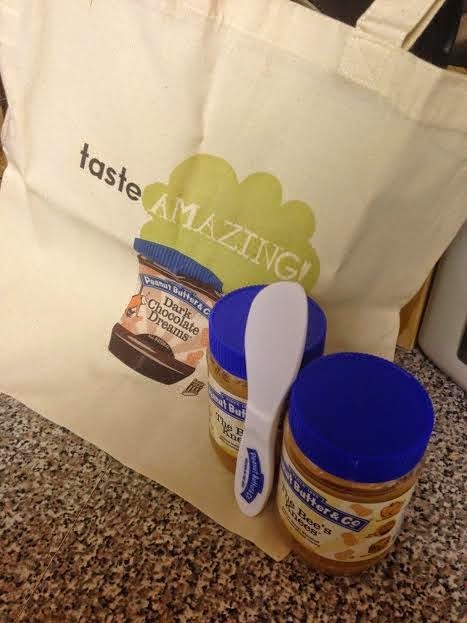 In the box from Peanut Butter & Co. we received two jars of The Bee's Knees, a peanut butter spreading knife, and a reusable bag! I was really excited to review The Bee's Knees because it is one of my favorite flavors that Peanut Butter & Co. offers! This peanut butter is blended with honey. My husband loves this peanut butter as well because he loves peanut butter and honey sandwiches. When we buy The Bee's Knees he gets the same great taste as using peanut butter and honey separately but he can make his sandwiches quicker. My favorite thing to do with this peanut butter is eat it with apples, yum! For this review I decided to make up a new recipe though, The Bee's Knees Honey Peanut Butter Cookies! They came out amazing and had a perfect peanut butter and honey taste. We brought them to our family's barbecue on Memorial Day and they were a huge hit! I will definitely be making them again! The recipe is below so that you can try them too! Preheat over to 350 degrees. In a large bowl cream together sugar and butter. Beat in egg. Beat in peanut butter, honey, and vanilla. In a separate bowl mix together salt, baking soda, and flour. Add flour mixture to peanut butter/honey mixture. Mix until well combined. Roll dough into 1 inch balls and then roll in sugar. places on baking sheet. Flatten with a fork, bake for 10 minutes. It's a Mom Thing Reviews and More is a parenting blog started by Alexandra and Gina as a resource for other moms! Here you will find product reviews, giveaways, recipes, crafts, and more. Our blog is a geared toward moms, because who understands motherhood better than other moms? Sometimes it's just a mom thing! Want to learn more about Alexandra and Gina? Click Below! #DataAndAMovie with Walmart Family Mobile!